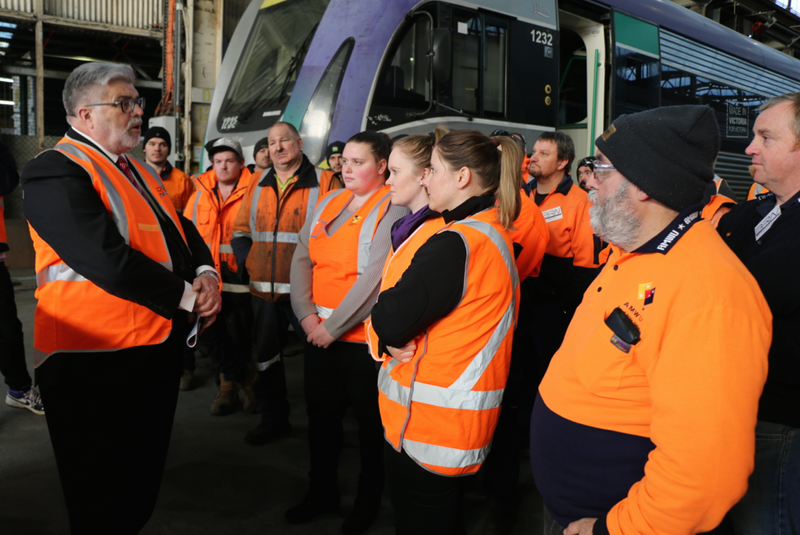 AMWU members have backed Labor’s national rail initiative that will coordinate train purchases between the states to boost Australian manufacturing. The National Passenger Rail Procurement initiative, which the Shorten Labor Government claims it would start implementing in its first year in office, aims to end the fragmented “boom and bust” cycle of each state purchasing its own rolling stock – often from overseas – while ignoring the national picture. Speaking at the launch of the initiative last week, Labor’s Industry spokesman Senator Kim Carr told AMWU members that the Federal Government should take leading role in encouraging the states to purchase passenger and freight rolling stock from local firms, using Australian-made parts and steel. “I’m very confident we can secure the support of the states,” the Minister said, adding that Labor will also examine the need for a national federal-state transport authority to help co-ordinate local procurement on $46 billion of rail infrastructure already announced. The launch was attended by 20 AMWU members from SSR, plus delegates from Alstom and UGL in Ballarat and Downer from Newport (Melbourne). Darren Thompson, our AMWU delegate at SSR, said the shop had proven its potential by designing and building two new locos in the past few years. “Local content has to be the way to go if we’re to grow more jobs,” he said. SSR co-owner Vin Nally said the sector requires serious Government investment to be able to compete with foreign companies. “We’ve proven we can build a world-class lco here, build it cheaper than importing it from the US. We have the skills in Australia, we need governments to invest,” he said. AMWU Assistant National Secretary Glenn Thompson urged the Coalition to match the policy as local procurement should be bi-partisan. “The existing inefficiency of having state and territory governments independently ordering and building trains is costing Australian jobs,” he said.